Emma Stone's hairstylist is setting the trend. There's a pretty brutal story behind why iconic jazz artist Billie Holiday always wore those white flowers in her hair. The legend goes that before one of her shows, she burned part of her hair with curling tongs. One of her fellow performers, thinking fast, ran over to a nearby venue where they knew flowers were sold, snipped a few bright white gardenias, and slipped them into Holiday's hair to cover the damage. Holiday liked it so much that it became her signature, although it once proved to be quite dangerous. According to her biography, before a show at Carnegie Hall in 1948, she was sent a box of gardenias, some of which she secured to her head. What she didn't know is that among those fragrant white blossoms was a hat pin. It cut into the side of her head during the show and made her pass out at the end of her third curtain call. Flash forward 70 years, and Holiday's signature is a Hollywood trend, with stars like Emma Stone, Beyoncé, and Rihanna all sporting flowers in their hair to give an instant romantic touch to any look. Thankfully though, hairstylists have found a way to achieve this look without their clients bleeding from the scalp. From roses to wildflowers, see how the celebrities have made their hair look as if it's in bloom, ahead. Of course bright red roses look great on a redhead. For the New York Film Festival premiere of The Favourite, hairstylist Mara Roszak weaved red and yellow roses in a cascading pattern into Stone's hair with help from bobby pins and brown-colored wire. "How fun is this?" Roszak wrote on Instagram. Roszak's made a habit of putting real, fresh flowers into her clients' hair, sticking a few white roses into Orange Is the New Black star Madeline Brewer's chignon for the 2018 Emmys. 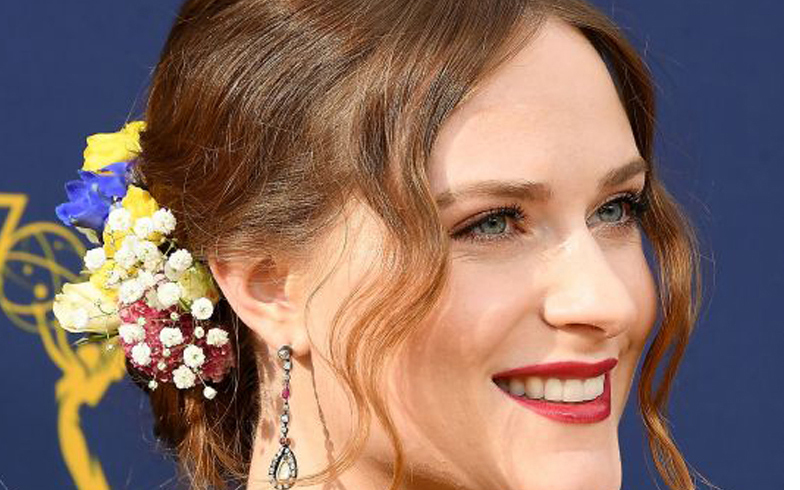 No stranger to wearing flowers in her hair, Evan Rachel Wood also took this look to the Emmys with hairstylist John D intertwining a colorful array of peonies, roses, and baby's breath into her low chignon. 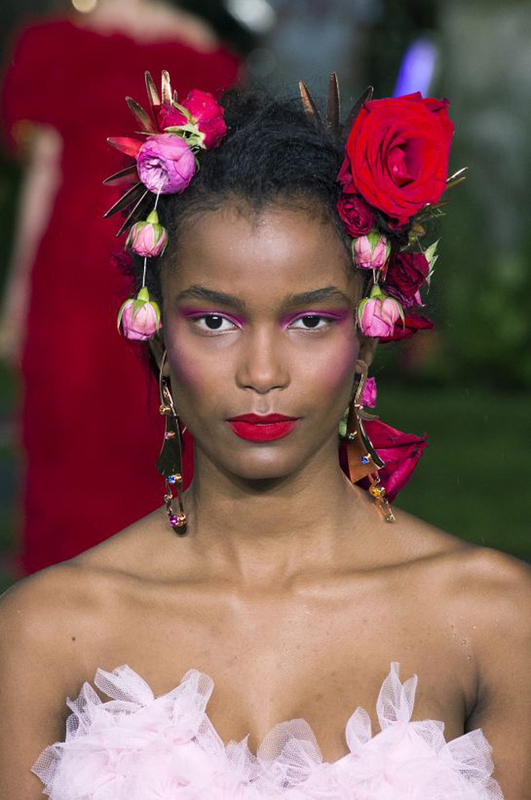 It's hard to make the hair as alluring and headline-making as the clothes at a fashion show, but hairstylist Odile Gilbert achieved this great feat at the spring 2019 Rodarte show at New York Fashion Week this September by weaving massive bouquets of various colored roses into each and every model's hair. Though the star of Emilia Clarke's hair at the 2018 Met Gala was definitely that ornate crown, the tiny purple flowers, courtesy of hairstylist Ben Skervin, were a lovely little surprise against her low bun. ... and then there was Vogue's September cover, which had Beyoncé balancing an entire flower centerpiece on her head. According to hairstylist Neal Farinah, it wasn't nearly as heavy as it looks. "I'm not sure how many there were, but it smelled so amazing," Farinah told Refinery29. "I know there were some peonies in there and lilies. The person who did the arrangement did an amazing job, and actually it wasn't very heavy."